Written by Steve Burge on April 28, 2017 . The Content Checklist add-on is perfect for anyone that wants to create a consistent experience with their WordPress content. If you publish a lot of content, it can be hard to make sure every post and page has the features you need. Using the Content Checklist, you can define tasks that must be complete before content is published. 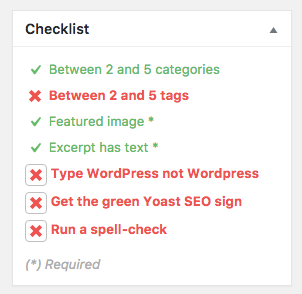 Next to every post and page, writers see a checklist box, showing the tasks they need to complete. Tasks can either be recommended or required. As writers complete each item, the red text automatically turns to green. In addition to the default rules, you can also create your own rules. Click “Add custom item” to create as many rules as you want. Each item on the checklist can be configured to meet your site’s needs. You can decide whether items are recommended, required or ignored. You can also set maximum and minimum values. 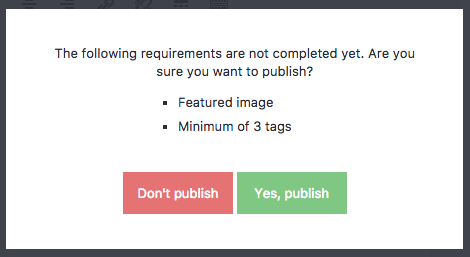 If the writers don’t complete all the requirements, they’ll see a pop-up message telling them what they need to do. 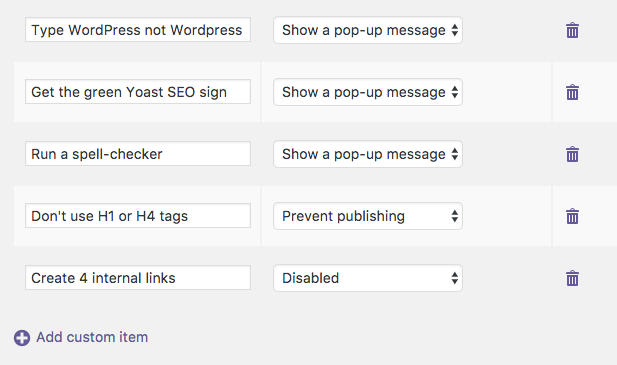 Yoast SEO integration. Why not ensure you have the green checkmark before publishing? Check for the correct spelling of certain names, such as “WordPress”, or your brand name. Check for a certain number of internal links. Look for missing alt tags and title tags. Force a certain size for featured images. This is great for themes that need images to be a certain height and width. Avoid using certain HTML tags, such as H1, H4 and even color or marquee tags!